Mueller Die Cut Solutions contacted Sani-Tech Systems in early 2013 about providing a custom Auger Compactor and Cart Dumper solution for their specific industry waste stream. Mueller Die Cut Solutions manufactures product using many different types of low density materials. The specific issues they were having with their original hydraulic compactor was the inability to fully compact the material they were processing. The spongy air packed material would simply push back out of the hydraulic compactor. By switching to the Sani-Tech Systems Auger Compactor with the ability to continuously push the material forward into the compaction bin, Mueller not only increased operational effectiveness but also saved money on operational expenses as well. 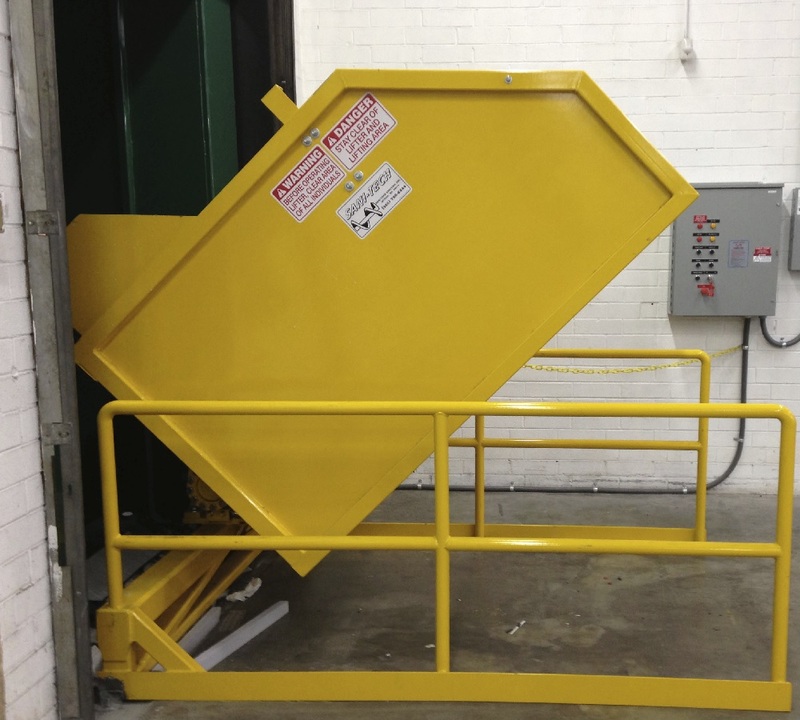 Added to the overall system design was a Sani-Tech Systems all electric ER48-1500 Cart Dumper which dumps full tote carts directly into the dock door enclosure over this Distribution Center Compactor. 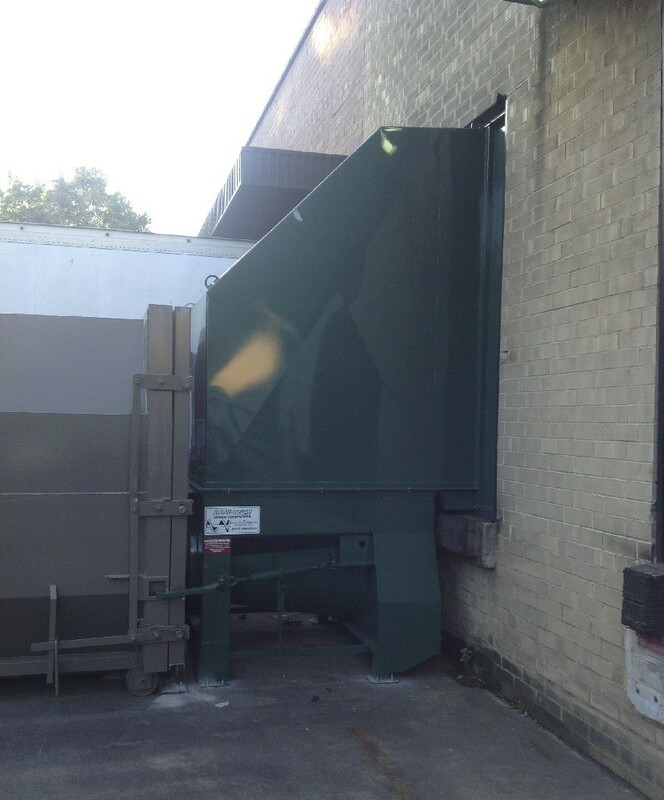 This decreases the overall time spent feeding the machine, and provides a one step operation for trash disposal. Once an operator places the tote cart into the Cart Dumper, he simply starts the system from the control panel which empties the cart and starts the Auger Compactor’s run cycle before returning the emptied cart into its resting position. "By switching to the Auger Compactor by Sanitech, we were able to reduce the number of pickups for our 40-yard container from 2 to 3 times a week to only 1, this cut our waste removal cost in half instantly. It does this by brute force; this machine is a beast, compacting every square inch of the container. It’s perfect for the low density materials we convert, as it shreds everything before it enters the container and getting the air out of these materials is the key to compacting it. It’s amazing that the Auger Compactor is able to exert twice the force and torque at half the power compared to a traditional compactor, and without any hydraulics to maintain or to leak fluid all over the ground. One of my favorite features of the machine is that the auger is always moving forward and forcing material into the container. This prevents material from springing back out of the mouth of the compactor, and eliminates wasted time the operator would spend running our old ram style compactor through several cycles before the material would stay in the container. Overall this is one of my favorite machines; it’s clean, efficient, environmentally friendly, practically maintenance free, and extremely powerful. If your company is “Going Green” or just looking to save money, I would start with auger compactor from Sanitech." Sani-Tech Systems ST1546/36 Auger Compactor with Dock Door Enclosure and ER48-1500 Cart Dumper by Sani-Tech Systems.